Joe Biden, former Vice President, doesn't have a lot to do now that he's out of the White House, unlike his former best friend Barack who seems to be having a good time with everyone but Joe. But when Joe's favorite train operator dies under some suspicious circumstances including a note with Joe's address he has to investigate this mystery. Will Joe and Barack's friendship spark again? Part buddy cop romance, part crime noir, part political commentary, with short chapters this is a quick read. Must have for fans of the Obama/Biden memes. Vice President Joe Biden and President Barack Obama team up in this high-stakes thriller that combines a mystery worthy of Watson and Holmes with the laugh-out-loud bromantic chemistry of Lethal Weapon’s Murtaugh and Riggs. Vice President Joe Biden is fresh out of the Obama White House and feeling adrift when his favorite railroad conductor dies in a suspicious accident, leaving behind an ailing wife and a trail of clues. To unravel the mystery, “Amtrak Joe” re-teams with the only man he’s ever fully trusted: the 44th president of the United States. Together they’ll plumb the darkest corners of Delaware, traveling from cheap motels to biker bars and beyond, as they uncover the sinister forces advancing America’s opioid epidemic. 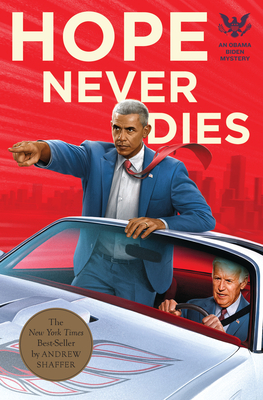 Part noir thriller and part bromance, Hope Never Dies is essentially the first published work of Obama/Biden fiction—and a cathartic read for anyone distressed by the current state of affairs.